Fiat India has launched the Linea 125 S at Rs 7.82 lakh, ex-Delhi. The Fiat Linea 125 S is the most powerful sedan in its segment and was first showcased at the Auto Expo 2016 as a concept. This trim sits above the current crop of Multijet as well as T-jet engined Lineas in Fiat India's portfolio. At the expo, Fiat also showcased the Punto Pure trims, bringing back the first-gen Punto in a slightly more affordable package. As of now, the T-jet Fiat Linea petrol retails for Rs 8.37 lakh for the base Active variant. This is a no-brainer given that the more feature-rich as well as powerful Linea 125 S sells for approximately Rs 50,000 less. Fiat India may likely phase out the T-jet or reduce its prices significantly (Fiat just confirmed that they have discontinued the Linea T-Jet). The Fiat Linea 125 S uses the same 1.4-litre turbo petrol engine from the T-jet trim in a different state of tune and makes 125PS of power and 210Nm of torque. This engine is mated to a 5-speed gearbox. Fiat isn't claiming any performance numbers, though expect the sedan to hit 100kmph from standstill in less than 9s. It should have a top speed around 190kmph. Fiat will be offering the Linea 125 S with a single colour option - Saffire Blue (Fiat just told us that there will be five colour options like the regular Linea and the colour mentioned here was just used for the concept). This colour and the black 16-inch alloys will be exclusive to the Fiat Linea 125 S (There are no black alloy wheels either). Inside, there is the new 5-inch navigation touchscreen system, ambient lighting and rear sun blind. Fiat has kitted the 125 S with rain-sensing wipers, all four auto power down windows, auto headlamps, cruise control, ABS, EBD, dual airbags as well as rear disc brakes. There is only one trim on offer as of now. The other Fiat Linea strong points like the 500-litre boot and 190mm ground clearance are carried forward from the other variants. 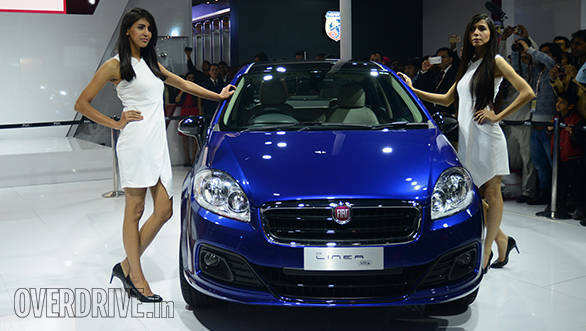 Fiat India had revamped the Linea range in 2014. The Turin-based automaker had also pushed the older Linea to a segment below and rebadged it as the Classic. The Fiat Linea Classic continues with a 75PS Multijet diesel engine and a 5-speed manual transmission. Fiat doesn't offer an automatic transmission option on any of its mass-market products here. The Abarth 595 Competizione is the only product from the company in India which gets a 6-speed AMT. On the sidelines, Fiat India has also updated the Punto Evo and Avventura diesel range as well. The 93PS 1.3-litre Multijet engine now becomes standard across the range for both the Punto while the aforementioned 5-inch touchscreen system is common for both. The branding for the diesel also changes to PowerTech. Fiat will continue selling the Linea, Punto and Avventura in Active, Dynamic and Emotion trims. Kevin Flynn, president and managing director, FCA India, said, "FIAT cars are known for their performance, and by adding more horsepower to our model range we are only living up to our brand promise 'Crafted for Car Lovers'. Besides that we do make great-looking cars."